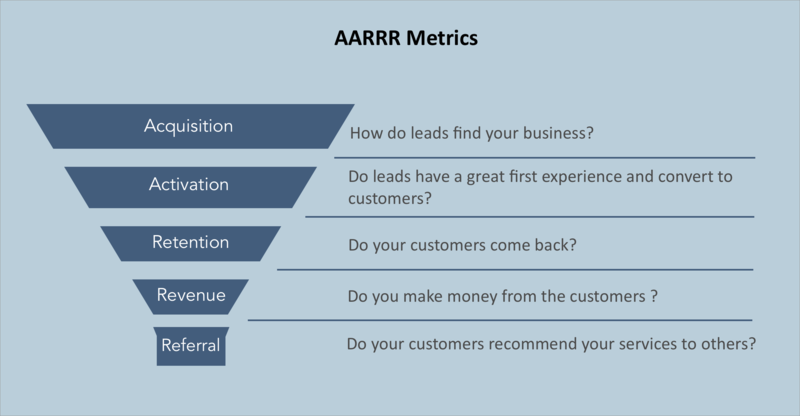 Learn how to apply the startup AARRR metrics to optimize your business. Last month, we co-hosted CozyCal's first workshop together with James and Sveta from Systems Matter. The topic was on how to consistently generate customers by applying a systematic approach for client management. In this webinar, James and Sveta walked over the framework of a systematic, 4-step approach to win leads, retain customers and expand customer base. From client intake, on-boarding, client management to collecting testimonials and referrals, each step is connected with the goal to help business owners generate a consistent flow of customers. As big picture thinkers and system experts, James and Sveta made me re-think about the positioning of CozyCal from a system's perspective. As a two-person team, Chris and I spend most of our time building new features, answering customer requests, and reaching out to potential leads. But we often forget to pause, take a step back and zoom out to see our business from a holistic view and ask the important questions. What's the value of CozyCal to our users? Where does CozyCal lie on our users' business roadmap? The systematic 4-step approach created by James and Sveta reminds me of the AARRR metrics funnel built by Dave Mcclure. Even though the metrics model originates from the startup world, the fundamental principles are applicable for small businesses as well as these 5 metrics represent customer behavior. I want to briefly show you what AARRR metrics funnel is because this framework has helped me to better position CozyCal's value. I also hope that you can apply this model to better measure and optimize your business in a systematic way. This diagram shows you the customer's purchase journey in the shape of a funnel. Once prospect leads enter the purchase funnel, the value of the leads become increasingly amplified as they go deeper into the funnel. To make sure the leads continue to move forward along this purchase journey, you can optimize each step along the funnel to nudge your leads further down the funnel. By understanding the AARRR metrics, you will be able to better diagnose the problems in your business and come up with targeted solutions to fix them. The startup AARRR metrics can help you to measure the right metrics at each stage of your customer's purchase funnel. Acquisition focuses on generating traffic and getting potential users to visit your website. This metric measures the effectiveness of strategies you use to bring people in the door. If you are trying several different traffic boosting methods including SEO, social media posting, blogging and affiliate programs, then you want to assess which channel brings in the most high quality traffic. For example, you can measure visitor clicks, number of pages being viewed and bounce rate to get a sense of the quality of your acquisition channels. Activation is about making sure the visitors have a happy first time visit and sign up to use your product or service. When a prospect arrives on your site, they're looking for the solution to a specific problem. You're not there in person to walk them through your offerings, so it's crucial to prompt visitors to take action - and make it effortless to do so. Besides having a landing page that clearly lays out your business's key offerings and features, it's also important to reduce frictions for your leads to communicate with you. For example, the simplest solution is to embed an intake form on your website to collect visitors emails and have them leave a message. But playing the emailing back-and-forth game is time-consuming for both of you, and more importantly, your leads might lose patience and drop off. This is where an event scheduling tool like CozyCal comes in. The benefit of having a simple scheduling widget embedded on your website is to make the 'first contact' experience seamless for your visitors. By showing your real-time availability for the core services you are offering, it becomes much easier for the prospects to take action by either scheduling initial calls or booking service sessions with you. With lowered friction for communication, it's more likely that your prospects will go further down the purchase funnel. The step following the 'first contact' experience is to create an on-boarding process that converts leads into customers. We will discuss more about on-boarding experience in the future. CozyCal can be embedded on websites for leads generation and service booking. Retention is about bringing users back to purchase your services or products again. In the SaaS (Software-as-a-Service) world, retention rate is all about making the product habitual for users so that customers will generate greater lifetime value and referrals in the long-run. It is an important metric because it indicates how useful the product is to users. The same principle applies to non-SaaS businesses as well. Even though retention rate of service-based businesses such as life coaching might be different from that of a product-based business such as custom-made sunglasses, to incentivize your customers to stick around will take a combination of intentional communication (such as delightful on-boarding experience) and high-quality services/products. You can send automated on-boarding messages, weekly status emails, promotion-based events and blog posts to keep them in the loop. This stage indicates whether your services or products offer enough value to convince the customers to pay you. With all the hard work you invested to guide your leads through the previous 3 stages of the funnel, this is the stage where you reap the rewards. If you are acquiring quality leads, activating a big percentage of them and retaining frequent and loyal customers, then revenue metric reflects the overall effectiveness of your purchase funnel. In addition to playing a role in the Activation stage, CozyCal is also a useful tool for you to collect revenue. We launched Stripe integration last November and a decent percentage of our customers have been collecting revenue through their CozyCal booking page. The automation of scheduling combined with payment processing simplifies the payment process for your customers, particularly for the returning customers. They can pay you upfront once the events are booked. As business owners, you get to increase bookings and secure revenue with minimum effort. With Stripe integration, your clients can book and pay you upfront through CozyCal's booking page. Referrals are one of the most effective and desired channel of customer acquisition. If you can easily get customers to talk about your service or product and spread the word organically, that's a huge win. In the workshop, James and Sveta introduced a systematic approach to requesting introductions and referrals. You can develop a survey or use Net Promoter Score to gauge customer satisfaction quantitively. But we find that so far, chatting with customers over phone calls is the best way to gain insights into what customers are thinking. Talking with your customers directly brings the customer-business owner relationship to a new level. For customers who are happy with your services and products, you can gently nudge them to refer your business to other people. Once the wheel of referral is turning, you will see a steady stream of customers coming in. The AARRR metrics framework has been widely adopted in the SaaS world. But as more non-SaaS small businesses are promoting their branding online, the AARRR metrics funnel is becoming relevant and useful to all types of businesses as well. By using the AARRR metrics as a framework, we are able to pinpoint CozyCal's value offering. You can also try to use AARRR metrics as a benchmark framework to measure and optimize each stage in your business.